I'm having a bit of an Architecture phase at the moment, building some of the recent sets in this line which have been burning holes in my shelves for weeks, or even months. I've always been interested in architecture - both my parents were architects - and I suppose it is true to say the LEGO® Architecture line is my favourite theme, and that creating my own microscale architecture is my favourite building pastime. This is partly because 21005 Fallingwater was my conversion set, but it's not just sentimentality. As the legend on the boxes says, "Enjoy your building experience." That's a cheesy bit of commercialese, but I almost always do enjoy them. The packaging is superb, the booklets have interesting facts and the finished models make great display pieces. The builds usually also contain stuff you wouldn't see in a regular kids' set, and hopefully these next few posts will highlight what sets Architecture apart for me. In this post I'm looking at 21019 The Eiffel Tower which was officially released on January 1, although it has been available for a few weeks in France. As with the Creator line, Architecture cannot request new part designs and I think it's also rare for them to contain new elements - i.e. existing parts in a new colour. Although technically, Architecture sets do always come with at least one new element; the printed tile showing the name of the building. 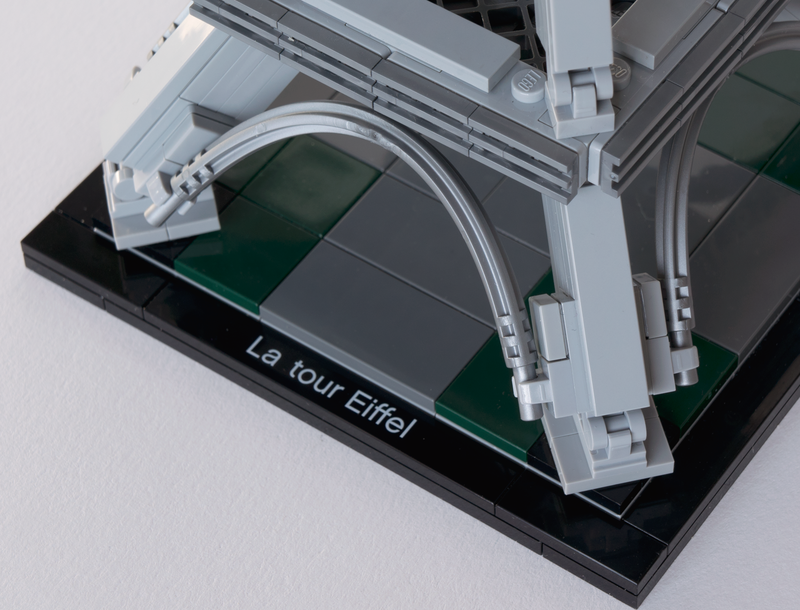 This set has two of these 1X8s, so that you can choose French or English - or both! The vast majority of the elements in the set are Light Bluish Gray [BL]/Medium Stone Grey [TLG], so it should be welcomed as a parts pack for the many who like to build in that colour. Architecture sets often come with some elements in large quantities, but there are very few examples here. The only one of real note are the 30 Flat Silver [BL]/Silver Metallic [TLG] grille tiles but you may be happy about the 12 Dark Green [BL]/Earth Green [TLG] 2X2 tiles as these are still uncommon. There are 24 1X1 plates in Light Bluish Gray which I know is hardly big news, but I'm always glad to see these in good quantities, since square 1X1s are often rejected by set designers in favour of the round versions (as they're simpler to apply and remove). As for rare elements, part 32200 in Flat Silver is rarest having only been in three previous sets and not seen since 2005. That's the curved soft flexible hose in the shape of an axle, with bars as connectors at either end. More on these later. Next rarest is the solitary 4X4 round plate with a 2X2 hole in Light Bluish Gray, which is also my favourite element in the set. It's only appeared in this colour in three sets prior to this one. At first it seems like a strange inclusion because a 2X2 round plate is placed in the hole - why not just use a regular 4X4 round plate? Because of course those have a round hole in the centre, whereas this arrangement has an axle hole, required here for stability. There's also two Black 2x14 plates which, it may surprise you, only came into being in 2012 and have been in just four sets prior to this one. If there was an awards category for Most Appropriate Use of an Existing Element, in this set it would go to the Dark Bluish Gray [BL]/Dark Stone Grey [TLG] 8X8 grille plate. Although this part was designed in 1989, it feels like it was born to be used as the first floor of the Eiffel Tower. Magnifique! The primary point of interest in the design of this set are the angled beams forming the four pillars of the Tower. Having a series of diagonals on both the horizontal and vertical planes calls for some impressive engineering. The pillars are attached to the rest of the structure with clip and bar connections. To set each clip at the required 45°, a few different techniques are used. On the intermediate levels, the clip pieces are simply rotated to 45°, as pictured above, and secured above and below. At base level, turntables are used to fix the tower to the ground. 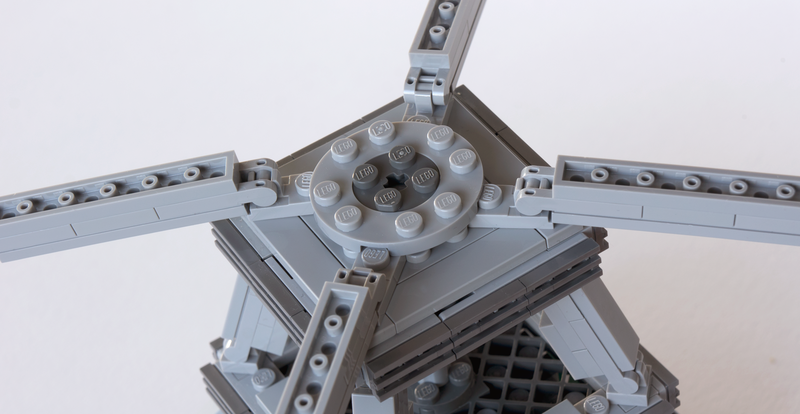 For the top two connection points, Dark Bluish Gray Dalek bricks are set at 45° so that the plates with clip can be attached sideways. It's fun to see this all come together section by section. And who said Architecture sets don't have play features. Naturally, the finished model is not highly accurate... because it's about a thousandth smaller in scale and made of LEGO bricks. Replicating real things in microscale presents many challenges and tough choices have to made. For example, you may be choosing between a few different elements to represent a certain architectural feature, none of which are perfect. Should you choose the one closest to the correct proportions? It might not actually capture the right 'feel'. Perhaps the one that gives the best overall look is best - but proves to cause you some tricky connection issues. (These often crop up when you're working in such a small area.) It's all a very tough balancing act, and for those designing an official set, probably the toughest challenge is that it also needs to follow TLG's (secret) rules around legal connections, stability and ease of construction. Not to mention hitting a price point. So hats off to the Designer, because the finished product is instantly recognisable. Whoever the Designer may be... their name is not given on this set, which is unusual for the Architecture line. Normal LEGO sets do not include the Designer's name because often several will work on one model, plus of course there's a lot more to a set than the person who designed it. But for the Architecture line, the Designer's name was always given and they wrote a few words for the booklet. This is because the Architecture line began life as a special co-production project with an AFOL called Adam Reed-Tucker, who suggested the line to TLG and designed most of the first sets. After Adam (or the later freelance Designers) complete each build, TLG review the design and make the required changes to ensure it fits LEGO's standards, and of course then go on to produce the sets. So, it's a little puzzling and sad there's no Designer listed on this set. Perhaps there were several... perhaps someone within TLG designed this one... perhaps the line is now successful enough that TLG are bringing it wholly in-house sometime soon? I hope this isn't a sign of things to come as I enjoy the copy written by the Designer, it gives a little insight into the challenges they faced. Which in this case, must have been achieving those clever connection points with limited elements in a small model. It is unusual to see in official sets and finding ways to get that geometry right whilst staying true to the form of the original Tower has translated into a very enjoyable building experience for me. Damn, commercialese works. 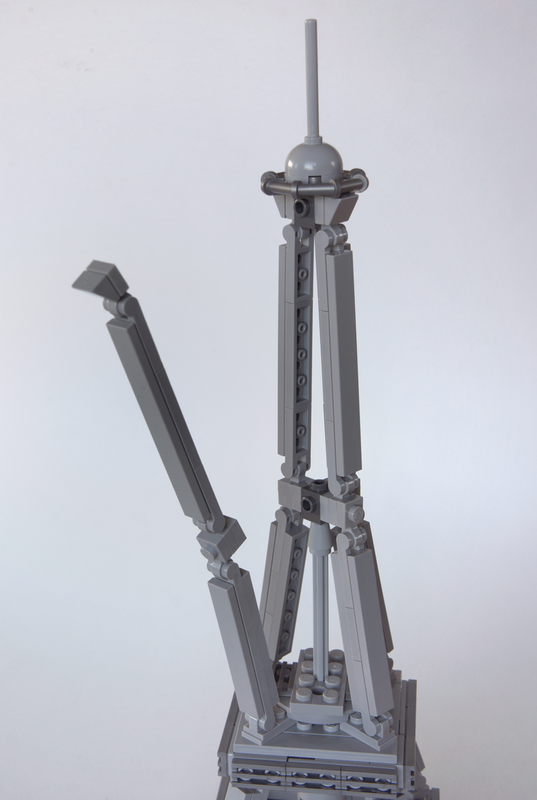 My thanks to LEGO's Community and Events Engagement Team for providing this set, and to Ongoose for twerking the Tower. 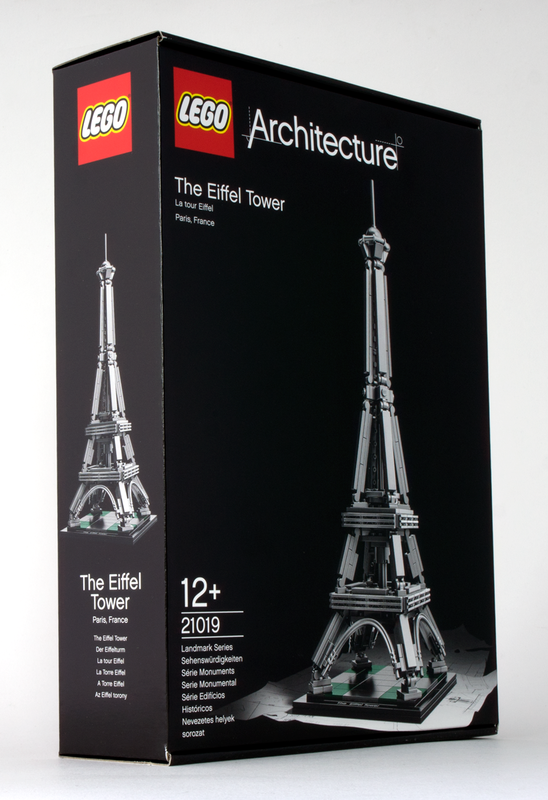 21019 The Eiffel Tower retails at GB£29.99 / US$34.99. I'd been hoping you'd do an article on new or rare elements in Architecture sets! (21005 was my conversion set as well.) As far as I can tell, only one wholly new part has made its debut in an Architecture model: the Corner Brick 3X3/22.5° Inside in 21010 Robie House. It later showed up in Sand Green in 21017 Imperial Hotel, making it one of a handful of new elements in that set. Then there's the extremely rare 21021 Marina Bay Sands with 1X1 round tiles in Olive Green - so far, the only appearance of that color in the theme and the only set to contain that element. Just because they can't request new molds doesn't mean they can't beat the requesting theme to market. 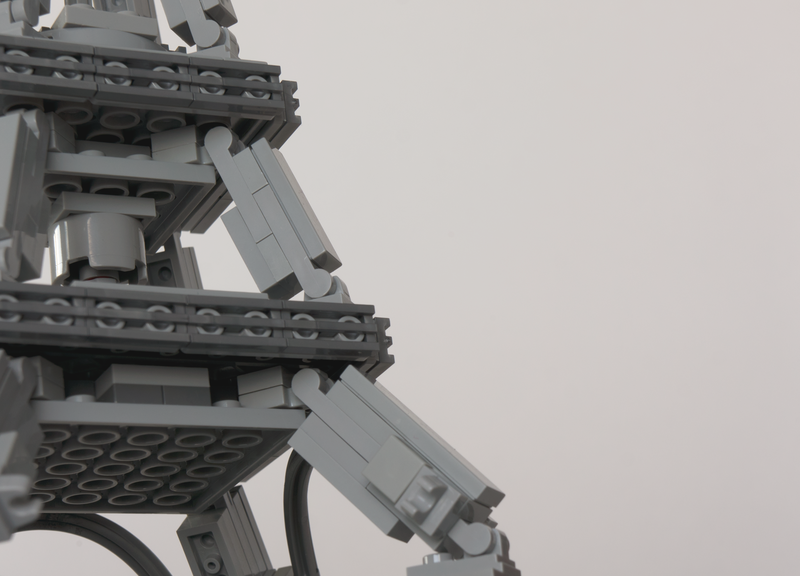 The original Bionicle Toa torso first appeared in the Technic Stormtrooper set, even though it was clearly designed for the Bionicle theme. As for old parts in new colors, there's no restriction on that beyond the standard one, which is that budget-wise, those "cost" more against the final model than ones that are used in other sets. And the previous article plus comments point out several instances of the 1x1 round tile in olive-green across at least three themes that I can remember. They just haven't shipped yet, and one of them is decorated with the Wooden Duck eye pattern. In contrast, there are some trans-light-blue plates in the UN building that seem to be exclusive to the Architecture theme. Oh, I know it's just a matter of beating the other sets to the market; I just saw it as sort of an academic exercise to look for new elements in a theme generally perceived as using common ones. Other examples: part #99206 first showed up in white in the UN HQ, now it's in five other sets; the Imperial Hotel had the first Brick Yellow 1x1 plate with holder, but it's in the Ewok Village as well, which likely took longer to develop. Ah yes the lovely interior corner slopes on Robie House... nice example Jacob. They appeared in Dark Red the following year in Ninjago 9450; I wonder if that's the set that commissioned the new part or whether Robie House actually did? Re olive round tiles - Aanchir mentioned on my previous post another new set that has them, 70133 Spinlyn's Cavern. Should be easier and cheaper to obtain than Marina Bay Sands! So excited about it. I have one, but can't find enough to say about it to warrant a whole post... will try to sneak it in! Surprised it hasn't appeared earlier. I've seen it at the clone brands, already. Ooh. I need these in light bley for my the floor of my Death Star Diner! Also, varying colours for speeder-bikes. Great post as always. Since you started your blog I've been looking forward to each new post! TLG's "legal" build rules aren't entirely secret. There's a presentation floating around from Jamie Berard called "Stressing the Brick" which contains some really fascinating insights into the process, assuming you haven't seen it already of course! Ya, somewhere I have a PDF that outlines what LEGO considers "legal" building techniques. I'm not sure if it's the presentation Sastrei is referring to or not. The presentation you mention can be found here. It's a bit old now, so many new elements have since come along just waiting to be stressed :O) but a fascinating read nonetheless, and important for everyone to know. I think it's just a "humorous shorthand to avoid a tedious answering section..." Very interesting read. "Should you choose the one closest to the correct proportions? It might not actually capture the right 'feel'. Perhaps the one that gives the best overall look is best - but proves to cause you some tricky connection issues." This is a common issue with _any_ complex design, whether it's an official set or a MOC, a building or an organic creature. I run into it a lot with my cars (less often about a single element and more often about general look). You can either chase the individual details, or you can focus on pulling the whole model together. My standard policy has always been to lean more in the "looks good" direction for a couple of reasons. Firstly, I'll never be happy with it if it doesn't look good. If I get all the details right and it looks clunky as a result, that's not a successful design, and it's not going to impress anyone else. Since all my cars have minifigs driving them, minifigs factor in. They also get a lot of the details wrong but look pretty cool as a final result. If a minifig is supposed to be 6' tall, then by comparison something like my Viper RT/10 would be about 25' long. But if I make it to scale with the height of a minifig, it looks like an single-seat roller skate. If you get enough of the details in there for it to be recognizable, but you focus on overall aesthetic, people won't notice the details you left out. All that said, not assuming that you got it right on the first try could allow you to blend the two even better. Maybe after a week you figure out how to rebuild a section that cleans up the overall shape and incorporates a detail that you had to leave out before. When you mention part 32200, are you referring to the part design or the specific element in that set? Because I've known that part to have been in more than 12 sets in 2006 alone, and if that's Dark Bley, I'm fairly certain it's been in every single one of those 12. Were you only citing System sets in the three other set usages, excluding lines such as Technic and Bionicle? Ah yes I wasn't clear, was I. I was referring to the specific element which is Flat Silver. I'll update the post, thanks.